Review in the In Rock magazine on the Baraka album "Gole Sangam - Persian Women songs"
Do you know a lot of bands performing in Moscow, in which there would be a girl playing a chimp-stick? This manual "bass orchestra" many, of course, remember on the show of Trey Gunn and Tony Levin, the virtuosos of King Crimson. Someone will remember Irene Orleanski, and someone is Russian progressive-folk-rocker Boris Bazurov. But at the Latvian fusion-jazzmen Baraka on a stick plays Devika Evsikova. On several of their albums, she was the main vocalist and played the bass guitar. Now the roles are distributed differently. Is the reason for this - the emergence of a new tool? 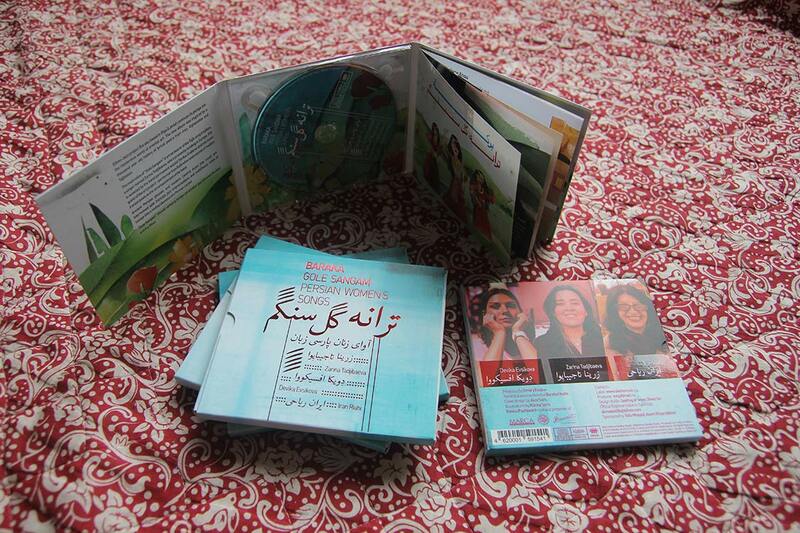 "Gole Sangam" translates as "Persian female songs": the album features Iranian, Afghan and Tajik love lyrics, and the main voice belongs to the singer Zarina Tadjibaeva, who lives in Europe, she is assisted by Iran Raikhi (Iran-Switzerland) reading the poems of contemporary Iranian poets with jazz accompaniment. The genre of recitation sounds appropriate, but it's difficult to say how much such an art will raise the authority of the team in Central Asia. Baraka there is remembered and loved, but rather as a foreign curiosity and proof of the importance of his art, and not as something authentic. The voices of the singers are intertwined, it sometimes sounds just beautiful. An example is the Tajik "Shekare Ahou" or the melodious "Gofti, Goftam". The hit, which gave the name of the album - "Gole Sangam" - rises in a number of things Baraka, who want to constantly recommend. (Other such songs are "Nuri Man" and "Lalaik", sung by Devika). The bass riff and solo of the guitarist Yegor Kovaykov are singled out in "Ay Yare Narenji Joonom", as well as the drum solo (in a thing called "Drum Solo") by the group leader, percussionist Dmitry Evsikov. Also note "Dar Intizori Yoram [Waiting For My Beloved]", played by Devika and Dmitry Evsikov, daughter with his father, "for two". The instrumental style of the group is great - only the lack of promotion hinders the greater fame of the project. The invited singers take the music away from the western sound somewhat, although it's still not a tradition, but a fusion, where epochs, cultures, continents intersect in a whimsical pattern. The knowledge about Persia can be limited by epochal lines from the children's play Persia, Persia - Fruit Paradise, grand photos of "incomparable wives" and smart cars of the last shah of Iran Mohammed Reza Pahlavi. This is all in the past, but the music of Iran in the version of Baraka continues to impress, and it seems that it would have sounded as successful at the court as Shah, at least King Darius. More about Baraka «Gole Sangam – Persian Women songs»can be read on the album pagehttp://sketismusic.ru/catalog/baraka_gole_sangam_persian_womens_songs_skmr128.